Call or SMS 0408 987 057 for availability of the next days tours. What’s included in the winery tours? Among the places you can visit in these tours include visiting boutique cellar doors, cheese shops, and vodka distillery. An experienced guide will be with you all day, to bring you around and share with you some knowledge about the places you will be visiting. Go ahead and browse our selection of tour packages and select your choice based on date, price, and inclusions. 1.30pm Leogate Wines free tasting after lunch. 3.45pm Private cheese and Chocolate tastings. 4.30 Hunter Vodka Distillery for Organic Gin Vodkas and flavoured schnapps. 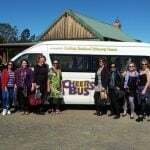 Cheers Bus is known for offering winery tours which you can personalise as you see fit to your interests, budget, and time. John should also be able to suggest some insider tips so you can make the most out of your trip as you explore our beautiful region. Our fleet of mini-buses can accommodate individuals, small, and large groups. Our vehicles are regularly maintained and air conditioned, so you can make sure that your trip is smooth sailing and quite comfortable. Contact Us today for more enquiries or Book Now to reserve the date! © 2019 Cheers Bus. All Rights Reserved.